MILFORD, Mass. – Maynard got the ball to start Wednesday night’s Thanksgiving eve game and marched down the field behind quarterback Tommy Smith. The Tigers got the ball down to the Milford 25, but on third down Smith fired to the front corner of the end zone only to have sophomore defensive back Carter Scudo cut in front of the receiver, make the interception, and manage to keep a toe in bounds. After a discussion between the officials, Scudo’s pick stood and the Hawks took over for the first time at their own one. Seventeen plays and 99 yards later, Milford had a lead that it would never relinquish. Senior Brendan White (nine catches, 119 yards) closed out his football career with four touchdown catches and an interception and classmate Shapel Feaster added a punt return score, as Milford finished its season with a 33-0 victory over the Tigers in the first game of this new Thanksgiving rivalry. The win ensured that Milford (6-5) ended its season with a winning record, closing out the year with six wins in its final seven games. “It’s huge not just for the seniors, but for the program in general,” Milford coach Anthony Vizakis said after the game. “We have a lot of sophomores that played, we’ve got a lot of young juniors that played. All credit to the kids for being coachable and taking it one game at a time like we’ve talked about all year, and finishing strong. Following Scudo’s interception, Milford came out with its power look with senior QB Ryan Pearl and moved the ball out across the 10 before turning to its spread look and junior signal caller Colby Pires (19-30, 287 yards). On third and 13, Pires hit Sean Lehane (four catches, 56 yards) underneath the coverage and he burst forward for 19 and the first down. 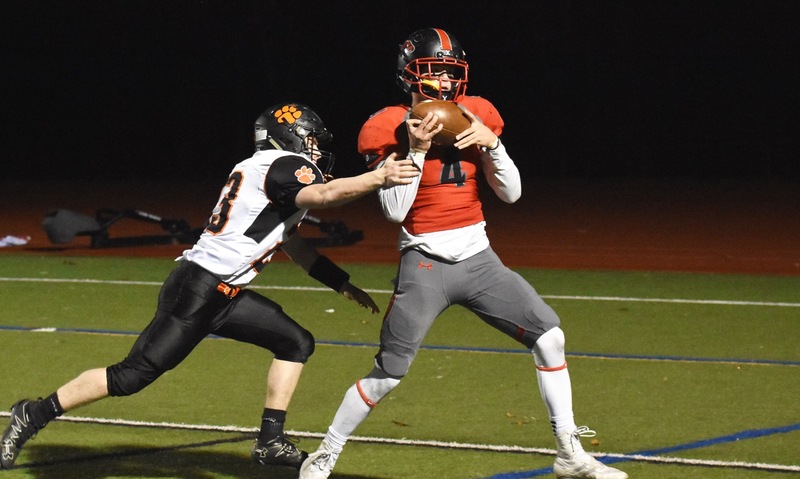 After having a Lehane 65-yard touchdown called back because of a hold, Pires completed a third and 15 pass to Hugo Lopes (four catches, 101 yards) for 35 into Maynard territory. The Hawks marched down to the 20 where they faced fourth and one, but a false start backed them up five yards. Pearl caught the Tigers crowding the line of scrimmage against the Milford bunch set and hit White in the end zone for a 25-yard score. After forcing a punt, Milford turned its second possession into another score. Pires connected with White to convert a pair of third downs, including a 23-yard completion on third and eight that got the ball down to the Maynard 23. Three plays later, Pires tossed his first touchdown of the night, hitting White one-on-one at the front corner of the end zone for a 20-yard score. The Hawks forced a three and out but a booming punt pushed them back to their own 18 with less than a minute to play in the half. Pires hit Lopes across the middle for 57 yards and then Feaster for 16 to get into position for a Lehane kick. His 36-yard attempt appeared to sneak inside the left upright but was called no good and the score stayed 13-0 at halftime. Milford wasted no time breaking the game wide open in the third quarter. Twice more the Hawks converted on third down, including a well-designed screen pass to Lopes that had the Maynard defense leaning to the strong side before throwing back across the grain for the first down. Pires found White on a receiver screen and he followed his blockers for the 14-yard touchdown. Although the two-point conversion was denied by the Tigers, Milford had a 19-0 lead. The Hawks defense held again, forcing another three-and-out. Dominic Scholfield crushed another punt that forced Feaster all the way back to his own 18, but the senior got a good bounce and took off. He broke to his left and found a seam near the Milford bench, made a good cut back towards the hashmark, and raced for an 85-yard, back-breaking touchdown. The teams traded turnovers on downs, but White got the ball back when he picked off Scholfield on Maynard’s attempted trick play. Milford came right back down and added to its lead. Luke Rosa (14 carries, 52 yards) had four carries and a catch to get the ball to the Milford 24. Pires and White connected for seven yards on fourth and two and then on the next play they hooked up again for 17 and a touchdown. Feaster capped the game with an interception to preserve the Hawks shutout and a strong finish to his football career and the Milford season. Junior Kevin Pyne took home the Tiger D’Amico Trophy for the team’s best lineman and senior Josh Ligor was named defensive MVP in a ceremony after the game.